I am looking for a Linux command-line tool that would report the disk IO activity. Something similar to htop would be really cool. Has someone heard of something like that? nmon shows a nice display of disk activity per device. It is available for linux. ?DiskName Busy  Read WriteKB|0          |25         |50          |75       100|                                                      ? ?sda        0%    0.0  127.9|>                                                |                                                      ? ?sda1       1%    0.0  127.9|>                                                |                                                      ? ?sda2       0%    0.0    0.0|>                                                |                                                      ? ?sda5       0%    0.0    0.0|>                                                |                                                      ? ?sdb       61%  385.6 9708.7|WWWWWWWWWWWWWWWWWWWWWWWWWWWWWWR>                 |                                                      ? ?sdb1      61%  385.6 9708.7|WWWWWWWWWWWWWWWWWWWWWWWWWWWWWWR>                 |                                                      ? ?sdc       52%  353.6 9686.7|WWWWWWWWWWWWWWWWWWWWWWWWWWR   >                  |                                                      ? ?sdc1      53%  353.6 9686.7|WWWWWWWWWWWWWWWWWWWWWWWWWWR   >                  |                                                      ? ?sdd       56%  359.6 9800.6|WWWWWWWWWWWWWWWWWWWWWWWWWWWW>                    |                                                      ? ?sdd1      56%  359.6 9800.6|WWWWWWWWWWWWWWWWWWWWWWWWWWWW>                    |                                                      ? ?sde       57%  371.6 9574.9|WWWWWWWWWWWWWWWWWWWWWWWWWWWWR>                   |                                                      ? ?sde1      57%  371.6 9574.9|WWWWWWWWWWWWWWWWWWWWWWWWWWWWR>                   |                                                      ? ?sdf       53%  371.6 9740.7|WWWWWWWWWWWWWWWWWWWWWWWWWWR    >                 |                                                      ? ?sdf1      53%  371.6 9740.7|WWWWWWWWWWWWWWWWWWWWWWWWWWR    >                 |                                                      ? ?md0        0% 1726.0 2093.6|>disk busy not available                         |                                                      ? It is not htop-like, but you could use atop. 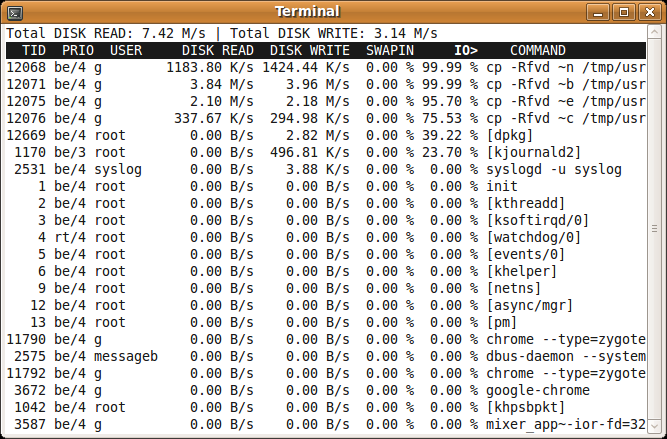 However, to display disk activity per process, it needs a kernel patch (available from the site). These kernel patches are now obsoleted, only to show per-process network activity an optional module is provided. Use collectl which has extensive process I/O monitoring including monitoring threads. Of course, it shows a lot more than just process stats because you'd want one tool to provide everything rather than a bunch of different one that displays everything in different formats, right? Not the answer you're looking for? Browse other questions tagged linux command-line io or ask your own question. How to join multiple lines of file names into one with custom delimiter? How to assign name for a screen?